Free Shipping Included! Save 1% on the OXO SteeL Ice Bucket and Tongs Set by OXO at Verve Wine Bar. MPN: 3107300. Hurry! Limited time offer. Offer valid only while supplies last. OXO SteeL Ice Bucket and Tongs Set: Whether you’re serving chilled lemonade or classy cocktails, fresh ice cubes are an entertaining essential. Whether you’re serving chilled lemonade or classy cocktails, fresh ice cubes are an entertaining essential. 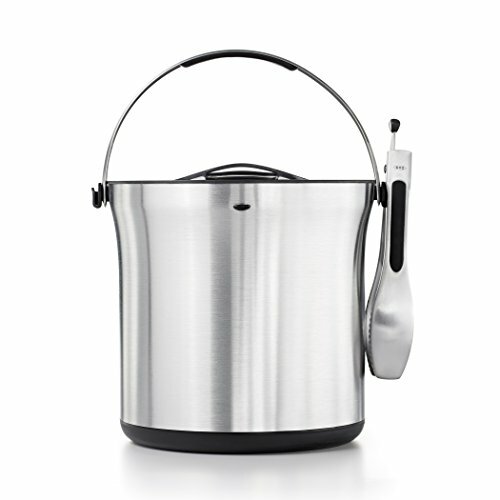 The OXO SteeL Ice Bucket and Tongs Set features highly insulating double-wall construction that keeps ice-cold temperatures in and ensures that the outer stainless steel wall stays condensation-free. For an ice supply that lasts the whole party, a grid of deep channels in the bottom separates any melted ice from the remaining whole cubes, keeping them solid longer. A flip-top lid ensures easy one-handed access and a secure close each time. The clear lid allows ice level to be visible, so you don’t have to open the Bucket to know when it’s time to refill. A non-slip base keeps the Bucket stable, and a soft, comfortable, non-slip grip on the handle makes it easy to transport. The set includes brushed stainless steel Tongs that attach to pegs on the sides of the Bucket for serving convenience and feature sharp teeth to easily grab ice cubes. At OXO, we consistently develop products that address even the tiniest of pet peeves, because we know it’s the little things that make the biggest difference. To keep a clean and elegant profile, we designed the handle of the Ice Bucket to rest on discreet rubber stoppers in line with the top o f the Bucket while not in use. To complete your barware set, check out our coordinating OXO SteeL Wine Sleeve and OXO SteeL Press and Pour Cocktail Shaker. Cheers!